In midsummer, the tall flower stalks of common mullein, Verbascum thapsus, begin to poke up, making this common weed in the family Scrophulariaceae highly noticeable in the road cuts and waste areas where it thrives. Native to Europe, northern Africa and Asia, it was probably introduced to North America several times as a medicinal herb. In the mid‑1700’s it was used in Virginia as a piscicide (fish poison). It spread rapidly and had become so well established by 1818 that a flora of the East Coast at that time described it as a native. It had reached the Midwest by 1839 and became widely naturalized on the Pacific Coast by 1876. Today common mullein is distributed throughout the U.S. and Canada wherever the growing season is at least 140 days and rainfall is sufficient (50-150 cm), especially on dry sandy soils. Common mullein is typically found in neglected meadows and pasture lands, along fence rows and roadsides, in vacant lots, wood edges, forest openings and industrial areas. 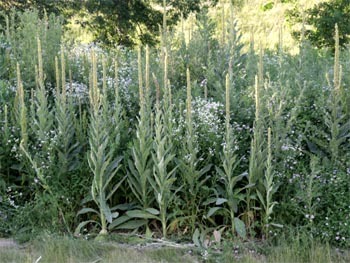 A dense infestation of common mullein. This plant, also known as wooly mullein, is an herbaceous biennial or short-lived perennial with a deep tap root. In the first year plants are low-growing rosettes of felt-like leaves. The whorl of leaves emerge from the root crown at the soil surface. The bluish gray-green, oblong to lanceolate leaves are 4-12″ long and 1-5″ wide, and are densely covered in hairs. Vernalization (exposure to cold temperatures) is required to induce flowering the following spring. A first year rosette (L) and the “wooly” underside of a leaf (R). In the second year plants produce a flower stalk 5-10 feet tall. The inflorescence is a spike-like raceme, usually singular, but sometimes branched. The alternate leaves on the flower stalk are larger at the base and decrease in size toward the top. The stalk’s growth is indeterminate, and the length of the flowering period is related to stalk height, with taller stalks blooming longer. Small yellow, 5-petaled flowers are grouped densely on the leafy spike. White flowers are seen only rarely. They bloom a few at a time throughout the summer, maturing on the stalk from the bottom to the top in successive spirals. Each individual flower opens before dawn and closes by mid-afternoon. The flowers attract a wide variety of insects (bees, flies, butterflies and other insects, only short- and long-tongued bees are effective in cross‑pollination. Flowers are also autogamous, so self-pollination occurs at the end of the day if the flowers were not cross‑pollinated. The tall inflorescences of common mullein, with the flowers blooming in a spiral up the stalk. Individual flowers have 5 petals. The fruit is a rounded capsule that splits into two valves at maturity. Each contains dozens of tiny brown seeds. The six-sided seeds are pitted and rough with wavy ridges and deep grooves. Individual plants produce 200-300 seed capsules, each containing 500-800 seeds, so that 100,000‑240,000 seeds are produced per plant. Most seeds fall within a few feet of the parent plant, falling from the capsules when the flower stalk is moved by wind or a large animal. There are no adaptations for long distance dispersal. 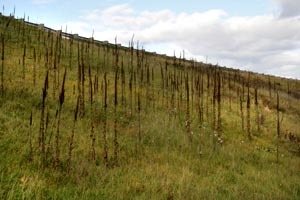 The old flower stalks are persistent and conspicuous. After flowering the entire plant dies – there is no vegetative reproduction. The dead flower stalks are rather persistent, so it easy to detect colonies of this weed at most times of year. Common mullein is found in many different habitats, occurring primarily in disturbed soils in full sun. The tiny seeds remain viable for decades in the soil (viable seeds have been found in soil samples archaeologically dated from A.D. 1300! ), so it is difficult to eradicate completely from an area. Seeds do not germinate well without light, so only those seeds which lie at or near the soil surface will be able to germinate. 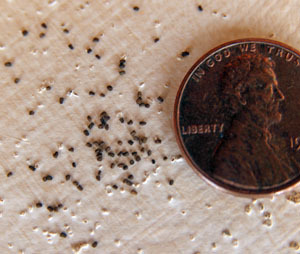 Populations can reappear quickly after many years when seeds are brought to the surface by soil disturbance. Most seedlings emerge almost entirely on bare sites, such as openings created by animal digging or road construction machinery. Although common in some areas, it is generally not an aggressively invasive species (except in certain parts of western North America) because its seed requires open ground to germinate. Because individual plants are easy to destroy by hand, it is rarely a problem in gardens and manicured yards, but can be quite numerous and conspicuous in other areas at times. It is intolerant of shade, so is easily outcompeted by other plants and agricultural crops. Populations are short-lived on undisturbed sites, “disappearing” into a dormant seed bank within a few years – until the next soil disturbance. The small seeds of common mullein. Common mullein is easily managed in smaller areas by manually removing the plants before flowering, preventing soil disturbance and establishing dense vegetative cover that will prevent seed germination. In larger areas, such as nature reserves, single plants and small groups on the edge of the infestation should be targeted first, then working deeper into the infestation. Plants should be pulled, hoed or dug by hand (easiest when the soil is moist) as soon as they are big enough to hold onto, but before they go to seed. Herbicides are generally only used when infestations are very dense, but may not be effective because the hairy leaf surface reduces absorption of chemicals. Prescribed burning can also be used during wet weather and when there is snow cover. Mowing is not effective, as the rosettes just increase in size and then bolt once mowing is stopped. There are a number of beetles that feed specifically on this plant and could be useful for biological control, but only one has been introduced into North America. The curuculionid weevil Gymnaetron tetron was accidentally introduced into Canada before 1937 and has since spread across the continent. The larvae develop in the seed capsules, destroying all the seeds in a seed capsule, but not all the seed capsules on a plant are infested. About 50% of the seeds are destroyed by larval feeding, but enough seeds remain that populations are not heavily impacted. Although thought of primarily as a weed, common mullein has been used as an herbal remedy for coughs and diarrhea, and topical applications against a variety of skin problems. The flowers were also used to make yellow, green or brown dyes, depending on how they were processed. Common mullein is sometimes grown as an ornamental. Sow seed in late spring to early summer. Moved to different home this plant was growing, I’m not familiar with it, but friends want to start one in their yard garden. Can you replant seeds from the flower pods?